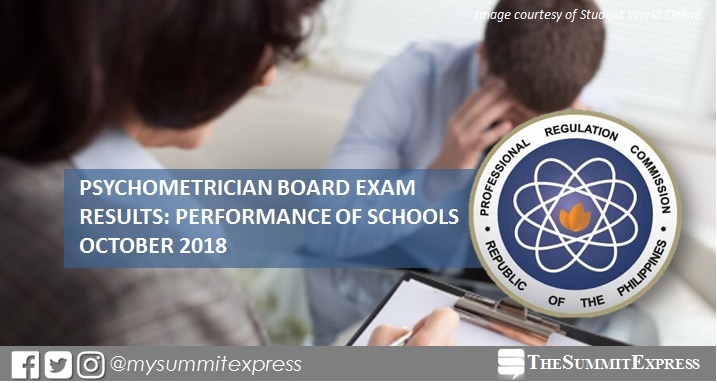 MANILA, Philippines – The Professional Regulation Commission (PRC) on Friday, November 9, hailed the top performing schools in the October 2018 Psychometrician board exam. The complete list of performance of schools is also available here. In the October 2017 exams, University of the Philippines (UP) - Diliman led the schools with 97.67% or 84 out of 86 passed the exams. It was followed by University of Santo Tomas (UST) with 96.53% or 139 out of 144 hurdled the tests. In the August 2016 exams, UP-Diliman also topped the schools with 98.39, 61 out 62 passed. UST placed second with 91.86% or 158 out of 172 passed the exams. Monitor this page for the real-time updates on Psychometrician board result. Check out also the official website of PRC for more information.